IZ-325A Insulated Tools: Izumi Products. 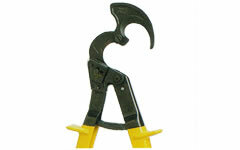 The IZ-325A ratchet cable cutter was designed to cut up to 325mm2 or 33mm outer diameter Cu cable. The IZ-325A features light weight, easy to use and clean cutting of the material. The cutter is equipped with the release meachanism so that the cutting can be backed out when necessary. 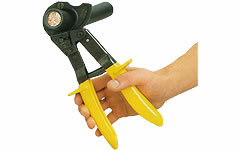 This economical ratchet cutter is ideal for an electricians wiring preparation tool.